I'm working on a project that will highlight around 50 of Tacoma's celebrities. What I mean by "celebrity" is not the Hollywood definition. I mean if Tacoma was an island unto itself, who are our most well known, well-loved and interesting people right now? I have already made a very long list and I need to trim it down so I was wondering who comes to your mind. I'd like to pick people who are mover-shaker types, dedicated people who are out there in the community making things happen and who are well known for it. I want people who are so good at what they do that people can't help but take notice. I want people who are visionary and hardworking. Super stars. Who does this make you think of? by The Jinxmedic on 8/26/2010 @ 3:44pm I have to say it- Jeremy Gregory is definitely on that list. A Tacoma cartoonist that gets the attention of Seattle is a BIG thing. (no joking). by Erik on 8/26/2010 @ 4:40pm This is an easy one: the top 50 commenters on Feed Tacoma. 1) The top 50 City of Tacoma commenters in public forum and public comment period. by Jesse on 8/26/2010 @ 7:17pm What about the guy that roller skates on ruston way with the boom-box all dressed in 1970's clothes. He's the coolest. by Mofo from the Hood on 8/26/2010 @ 10:18pm Oh yeah...let's not forget what commercial/fine artist Andy Warhol said. Something like, "Everyone gets their 15 minutes of fame." Uh-huh. Andy was the celebrity-conscious Material Girl that Madonna could only pretend to be. But let's be careful about throwing big words around. A "celebrity" isn't necessarily an accomplished person. A celebrity could be someone who is famous for being famous. by ElectricElliot on 8/26/2010 @ 11:39pm Basically anyone in the CLAW. Just eenie, meenie, miny, mo it. by Dave_L on 8/27/2010 @ 11:30am That's a lot of criteria to meet. Whether it's politics, philanthropy, art, or community service, most of the most "dedicated people who are out there in the community making things happen" and "visionary and hardworking" aren't necessarily the "most well known, well-loved and interesting people" out there. It's usually not in their nature, nor do they do it for such recognition of pats on the back. But the heading of your post is Celebrities, and I'm sure that list will be lengthy too, if not all-inclusive. The music category alone would take pages. Dennis Flannigan would top my list, though he wouldn't want to be part of any such list. by JeremyGregorySucks on 8/27/2010 @ 12:37pm Maybe my view is skewed, but I vote Blanketman! by Erik on 8/27/2010 @ 1:09pm Let's be fair about this. It should be the top 50 Tacomans with the most number of Facebook friends. That would be an objective measure of "celebrity." by Crenshaw Sepulveda on 8/27/2010 @ 1:13pm I'd like to add that Dennis Flannigan is a fine cartoonist in his own right. by NineInchNachos on 8/27/2010 @ 1:35pm Dennis Flannigan is a flake! I keep asking him about his cartoons and he always blows me off. by The Jinxmedic on 8/27/2010 @ 3:03pm That's gross. by Jesse on 8/27/2010 @ 4:10pm What about the pimp at the mall preaching about the baby Jesus? by debivans on 8/27/2010 @ 6:34pm I think Linda Danforth qualifies as a Tacoma Celebrity. Visionary, check. Hardworking, check. Superstar, check. Oh yeah, and the "Save Our Sonics" guy, just cause he will never quit. He is hope eternal. by Jake on 8/27/2010 @ 6:51pm Hmm maybe some Naccarato love? Save our Sonics dude is a hoot! Funny guy. I was always like wtf seeing him around and then he was co-hosting the Best of Tacoma awards at Masa and was funny as hell. by Ann on 8/28/2010 @ 8:13am Dave L.
He has a beautiful anchor on display at Thea's Park -- check it out while you're enjoying the Maritime Festival! by ALT on 8/28/2010 @ 2:31pm Even though I've lived in Tacoma for...what...five (nonconsecutive) years now...I admittedly don't know many of the locals. Suffice to say I don't get out much. I would suggest the chalking Frost Park regulars such as Stowe, RxR, and Mark Monlux to name a few, whose artwork has been appearing literally on the streets of Tacoma about every week for nearly 3 Summers already. Not to mention these three cartooning crazies formed a co-op (the C.artoonist's L.eage of A.bsurd W.ashingtonians) built around their pervasive artistic skills. But then, my world of acquaintances is a small one, so I am uncertain how it compares to the broad spectrum of locals that populate the city of Tacoma. I must say this: Soon after moving here in 2005 I subscribed to the TacomaArt Listerv, and very soon after I began receiving the first of many outrageous, offensive, irreverent and hilarious cartoons, commentary, and spoofs from RxR (RR) Anderson. Even after I moved to Maryland for a year (and failed to properly unsubscribe from the Listerv) I could not escape his screwy postings. 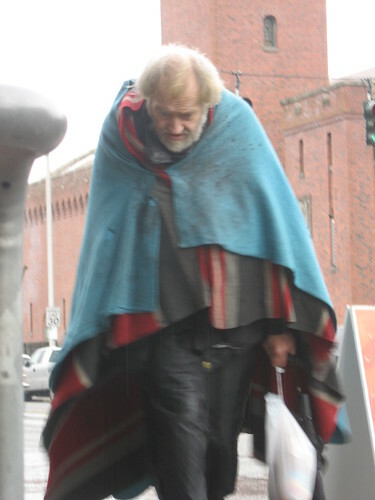 It was not until some time after I had moved back to Tacoma that I finally met the man: It was in April, 2008 at the corner of 9th and Pacific - high noon. I was among several who had answered to RxR's brazen challenge of artistic skills issued through the Listserv and headed with the title "ATTENTION COWARDS". Just this past Friday in August of 2010, Frost Park still teams with chalking artists both professional and novice as they flex their creative muscles and compete for fabulous prizes offered by local sponsors. This cartoonist for the Weekly Volcano and creator of the Chalk Challenge helped draw many of us socially awkward artists out of our studios/caves and got us mingling with other humans. I'm certainly not as cowardly as I used to be. So, when I think of Tacoma I immediately think of RxR Anderson. I don't believe one needs to be especially enlightened to see that he is among some of the more influential and involved people in this city. If you are in need of a third eye however, Mark Monlux of C.L.A.W. may be able to loan you his fez. by ALT on 8/28/2010 @ 2:57pm Absolutely Erik B! Time and again he has taken it upon himself to promote the Chalk Challenge and snag sponsorships, helping to perpetuate community involvement and interest in the local arts scene. It's not just he chalk art, though. He's always there talking up local musicians and various artists. Three hours of sleep tends to impair my spelling. by captiveyak on 9/1/2010 @ 8:51am oh god don't do it! Don't list 50 more people for Seattle to wrench from our clutches! by L.S.Erhardt on 9/1/2010 @ 3:32pm Why not send these 50 up to the 206 while carrying a case of acute apathy? It's remarkably contagious. Look what it did to Detroit in a mere 50 years. Down from 1,800,000 to 920,000. From being a Great American City to being... well, being Detroit. Not caring about your fellow man and not caring about where you live can turn any city into a Detroit. Apathy is the ultimate social cancer. I take my proposal back. Nobody deserves a case of Apathy. The sooner the case here is cured, the better. The real question is, how the hell do I go about doing it? I know jack about starting and operating a club. by NineInchNachos on 9/1/2010 @ 4:13pm apathy... or a massive sea change in world automobile market consumer appetites... but whatever... gah Apathy!